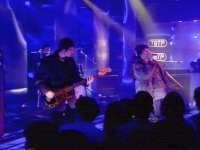 On the 4th April 1997 two Manchester lads made their debut on Top Of the Pops. Before reaching this accolade one of them had had a previous and long Rock N' Roll career the other had also been in previous bands but this was the combination that we had all been waiting for. They borrowed suits especially for the day and used a changing room that had previously been used by Take That. These two however weren't here to play, they were here to present the show. Mark: Greetings space cadets and welcome to Can't Cook, Won't Cook and tonights celebrity chefs include. M: But they're wrong, it's Cast, meanwhile over here Michael Jackson's Nephews named after a Sci-fi film. M: 3T, Two coffee, nice slice of fruitcake, into the top four at number 3. L: Right and next up from right across the pond, that's the Isle Of Man, No Doubt, Don't Speak. M: Entrance, with the new craze that's sweeping the nation - Disco Music. M: It's what you hear at the funfair, if you want to go faster just scream. M: Entance and D.I.S.C.O. which is short for Disco-thee-teh-que. M: Now this next lot have come a long way since they went everywhere in a clapped out Bedford Rascal van. L: They've got two now. M: From Rock City Northwich. M: Top 2 from the Charlatans 'North Country Boy', come on Lard you do one. L: Right next up is DJ Quicksilver and, cards on the table, I've never heard of him. M: Oh yeah you have, DJ Quicksilver, Derick Quicksilver, Quicksy, you know he's got red hair, big glasses. M: The only great thing about being in a double act is that you get to share the work load, right our kid? M: That was DJ Quicksilver. M: And now into the top 13 at number 12, Living Joy. M: (Looks at Lard) Where would I be without him? L: Living Joy, where can I find Love? M: I wouldn't worry about that our kid. M: Here's the Top 10. 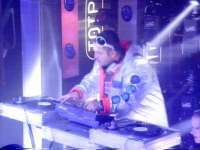 At 10 It's 'Gotta Be you', 3T featuring Herbie. M: At 2 Who Do You Think You Are? down from 1 The Spice Girls. L: Straight in at the top this week a band who struggled for years as The Chemical Toilet Brothers. M: But they dropped the bog bit and they've nabbed the top spot with the whoppin Block Rockin Beats, The Chemical Brothers. M: The Chemical Brothers, Donald and Derick Domestos. L: I didn't even know they were related. M: Next week your genial host Mark Owen, to play us out, Spice girls, Who's your favourite Lard? M & L: Ta ra now. On 24th May 1997 Mark & Lard presented their second Top Of The Pops.